Mix the poppy seeds with the sugar and breadcrumbs, add the boiling water and leave it to stand for 5 minutes. Drain the apricots, dry with kitchen roll and dice. Whisk the butter, add the sugar and continue to whisk until it forms a smooth batter. Add the eggs one at a time. Mix the flour and baking powder then add with the milk to the batter. It should be very smooth. Pre-heat the oven to 180°C (160°C fan oven). Remove 1/3 of the batter and combine with the poppy seed mixture and the apricots. Grease the loaf pan and first add the clear part of the batter. Then spread the poppy seed and apricot mixture on top. Using a fork, drag from one side of the loaf pan to the other in a zigzag shape to create a marble effect in the clear batter. Bake the cake in the lowest part of the oven for 20 minutes with the lid on. Then remove the lid and cut down the middle of the cake with a knife. Leave to bake for a further 40 to 50 minutes without the lid. 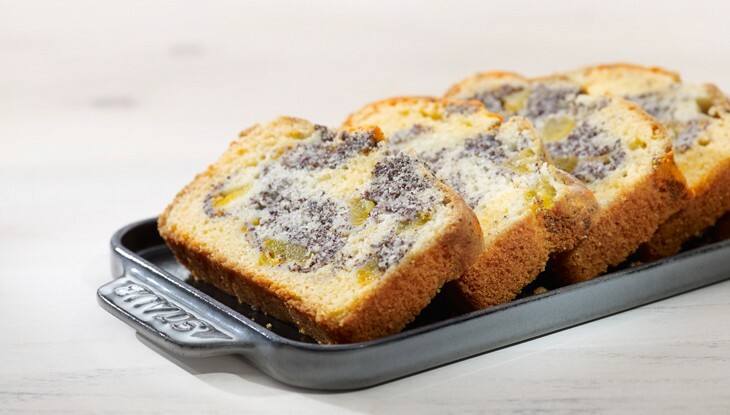 Remove the loaf pan from the oven, allow to cool for 5 minutes, turn the cake into the lid and leave to cool completely. Serve directly on the lid like a serving dish.